Here are a few video presentations to enjoy as you sip your morning cup of coffee Monday. This first video below will surely wake you up. This is a provocative treatment of layering text over dialog. Text appears as every word is spoken but done in a way to accent and emphasize and highlight. Obviously I'm not recommending you do something like this for every second of your presentation, but this little piece of work is a creative, inspiring text treatment that will give you ideas for working with your own text, images, and narration. It is worth repeating, however, that I never say we should do it like this presenter or that presenter. We have our own styles, our own needs, our own audiences. But if we want to improve our abilities in all aspects of presentation — including visual communication, which is under valued and misunderstood by the masses — then we've got to open our eyes and learn from the traditional, the classics, and the famous, as well as from the bleeding edge and the avant-garde. Here's another text animation of the same Pulp Fiction dialog. Below is another interesting treatment of text and images (sans narration) to tell a story. This has been popular on the net for a couple of weeks now. At first I did not appreciate it because the size (and speed) of the text was hard for me to catch (ah, the joys of being over 40). But after watching it several times I realized it is a brilliant simple online presentation which sort of explains "web 2.0" in a very novel way. 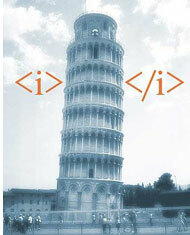 Those who understand html a bit may especially enjoy the presentation. Below is an interesting video presentation on "Net Neutrality." Regarding multitouch...uh...I guess no more eating popcorn while you work...makes for a very nasty looking touch screen. Great videos! Thanks for sharing. That Web 2.0 video is especially relevant to a class I'm taking right now. As far as multi-touch goes, I can't wait for this technology to work its way into stuff (other than iPhone). I'm ready to ditch keyboards, mice, and track-pads! Tony's right, though, no eating while working unless you like cleaning at the same time! I have been toying with putting together a presentation like the Pulp Fiction video. Does anyone have an idea what software would work best for putting it together and how much design expertise one might need? That multi touch screen is amazing, I've heard people say that technology was difficult to use, but after watching that video, i'm impressed! That first video was PERFECT for right after my coffee. Had to watch it 3 times. I definitely preferred it over the second, but it was really neat to see the contrast of type. Thanks!